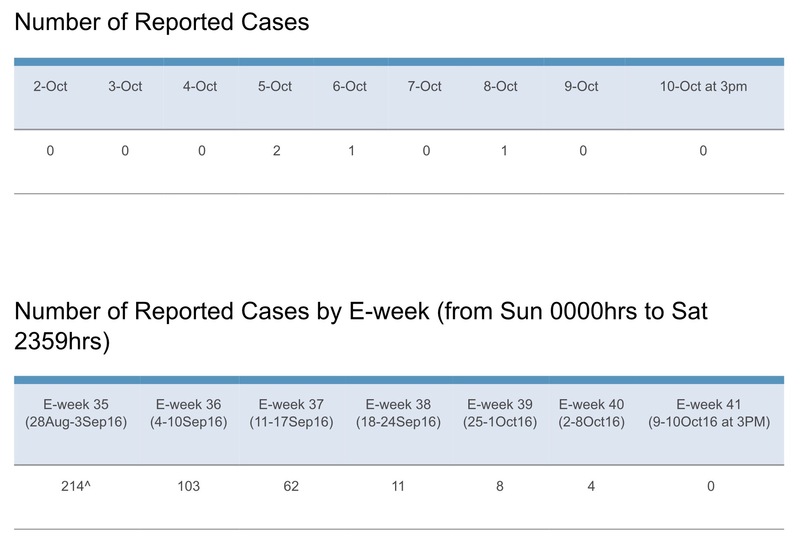 The number of reported Zika cases in Singapore has plunged over the past couple of weeks, as can be seen from the National Environment Agency’s website (screenshot below). Only one cluster – the original Aljunied-Sims Drive area – remains active (with new cases being reported) currently. How much of this is due to actual control efforts, and what can be attributed to under-reporting (the Zika test is no longer subsidised by MOH except for those involving pregnant persons, and any suspect cases are no longer directed to the hospitals) is unknown. The number of dengue cases has also fallen, with 175, 174, and 138 cases during E-weeks 37 to 39 (up to 1st October 2016), which perhaps corresponds with the higher rainfall as well as extended vector control efforts for Zika. We will know more next year, including the outcomes of the local Zika-infected pregnant women.